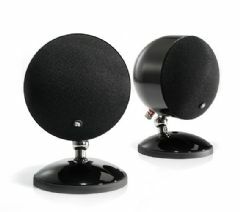 Audio Pro SB-1 Sphere Monitor Speakers - is a stylish and versatile round little monitor speaker. Quality in both sound and design, SB-1 will blend into any modern home. The small size makes it easy to place SB-1 anywhere. Thanks to innovative design you can place SB-1 on a surface, or mount easily to wall or ceiling using the supplied integral stand. The joint between speaker and foot makes it easy to aim SB-1 to your listening position. The speaker body and foot are made of pressed sheet metal, giving SB-1 a very solid build quality. Available in black or white high gloss lacquer.